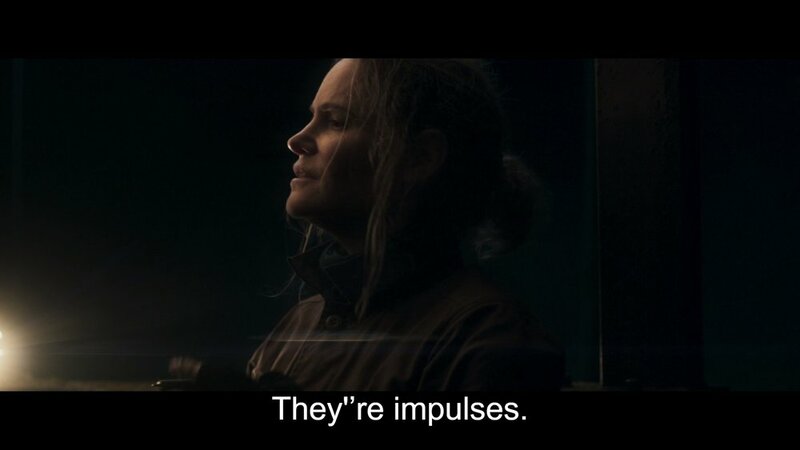 Annihilation isn’t an easy film to fully understand on the first watch, and not all of this is because it’s ambiguous. For it’s incredibly lofty goals and concepts, the script routinely falls short of creating a comfortable environment to want to inspire these thoughts. But it would be totally false to misinterpret this and believe that there isn’t a coherent, important thesis at the heart of the film. In this essay we’ll explore that thesis using some outside context, and the film itself to describe the more incomprehensible moments. It seems like a simple question, because we ask each other all the time. We’re at a party and we introduce ourselves: “Hello, I’m (name) and I am a (occupation).” But that simple response clearly doesn’t encapsulate who you are in any holistic way. In fact, it’s much harder to identify who you really are than it may initially seem. I talk about this quite a bit in the essay that I wrote on Toy Story through the lens of Jean-Paul Sartre’s terms, “Transcendence” and, “Facticity.” That is, who are you to yourself in contrast with, who are you to others, and which one of those terms more adequately describes who you are? Throughout history, humanity has made comments on this question, regardless of if we even knew it. The ancient Greeks adopted a method of person to person identification in which your family name, came before your first name. This also developed among Asian cultures and still exists today. Something as simple as our naming convention says a lot about who we are. We’re not just ourselves, we’re inextricably tied to our ancestors, families, and tribes, and this is the lens through which society views us. And it doesn’t stop with our familial ties. During times when our families identify heavily as a nationality, family ties become tribalistic ties. This was the reality for virtually every generation that has preceded us—and for many families, this is still the reality. This mentality has numerous positive and negative effects. It’s used to convince men and women to give their lives away in war, but it’s also, historically speaking, an intensely powerful community adhesive (for good or bad). You might recall the beginning of Full Metal Jacket, where success in boot camp was contingent on fundamentally changing the nature of these men from individuals to soldiers. What is that? But the reason this matters so much is because this isn’t a discussion that has a limited scope—this concept governs our actions every day of our lives. This way of being, of at every moment caring about ones individual life story is a quality of being human. That is to be a human being is to have a deep inwardly facing consideration and interrogation of our outwardly facing identity—and this understanding is joined at the hip to our essential human agency. This phenomena and concept was described by Martin Heidegger in his groundbreaking (yet uncompleted) book, “Being and Time”—the term he created was, “Dasein” which translates from the German to roughly, “being ones own.” The word that we would use in place of this concept is, “authenticity.” This is what puts the being in human being. If in your place, your parents gave birth to another being that shared your name, your physical appearance, and every outward sign that it is you. Would there be anything missing from the world? The natural inclination is to emphatically say, “yes there would be something missing.” But what is it that’s missing? It’s the internal, rider of our individual consciousness saying, “Yes I am here.” It’s the ego. It’s the thing that tells us that it is something to be like you, separate from the judging gaze of the family or state. This is what it is to, “be ones own” or to be, “authentic.” For us, each day we open our eyes and experience the world, our being takes a stand about who we are. This is reflected in every action we take, whether we are conscious of it or not. 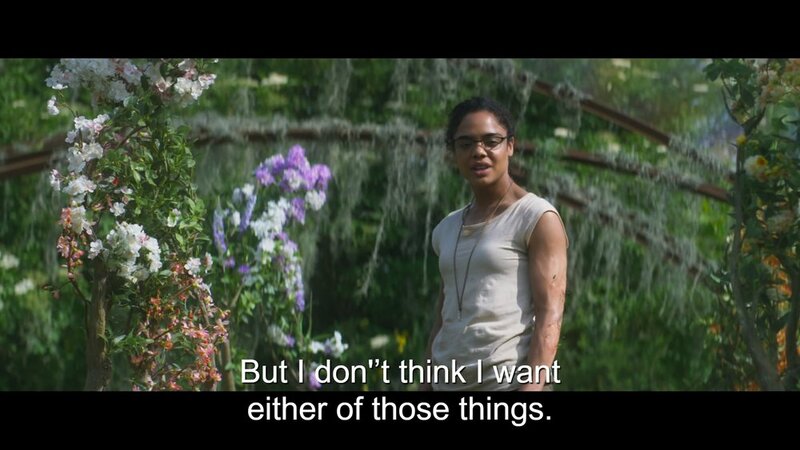 In Annihilation we see a world where this understanding of what it is to, “be ones own” breaks down and we confront the reality of what it means to be a human versus a human being. 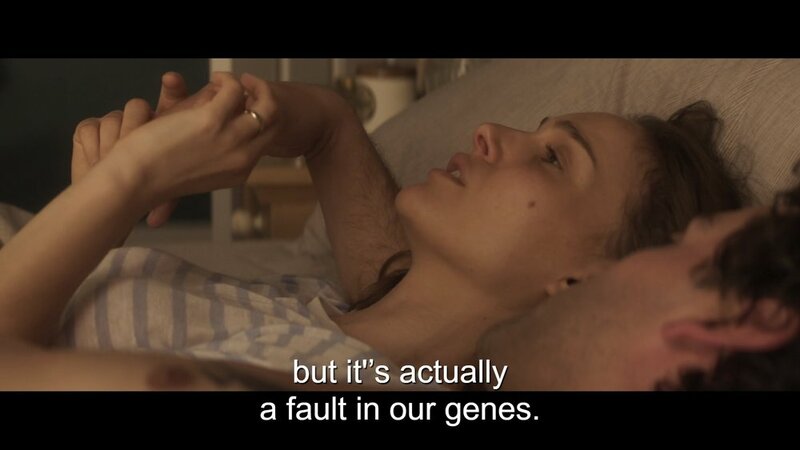 At the beginning of the film, we see visuals of a cervical cancer cell, taken from a woman in her mid-thirties. 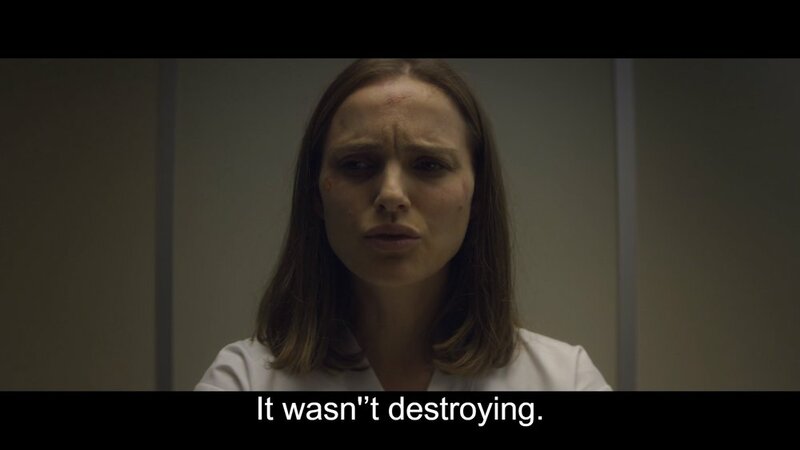 We hear Lena’s (Natalie Portman) voice as the cell beings to duplicate. 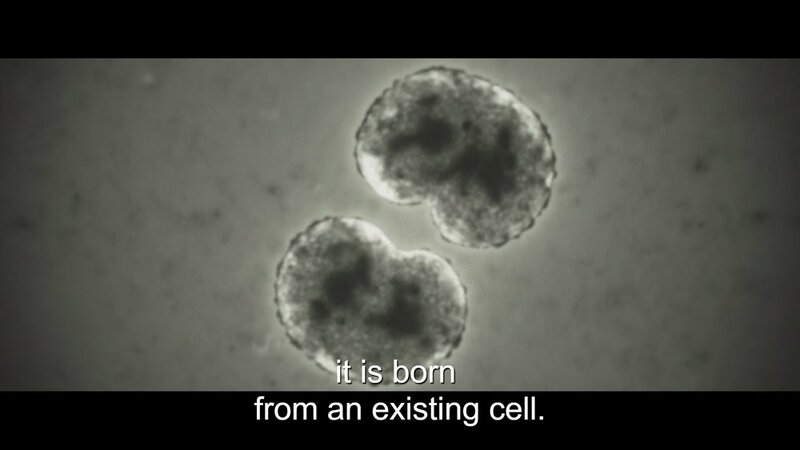 From the beginning of the film, we’re talking about all of life in the history universe, descended from one cell. 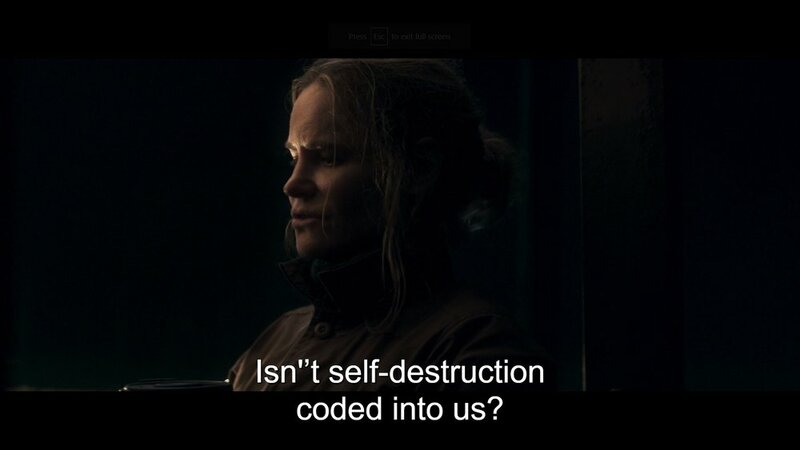 Alone this concept is valuable in the sense that it accentuates the plot of the film, and tells us who Lena is (a biologist at John Hopkins), but what does this say about the characters in the film (us)? Perhaps it verifies for us an evolutionary fact, but in context this will grow to mean much more. 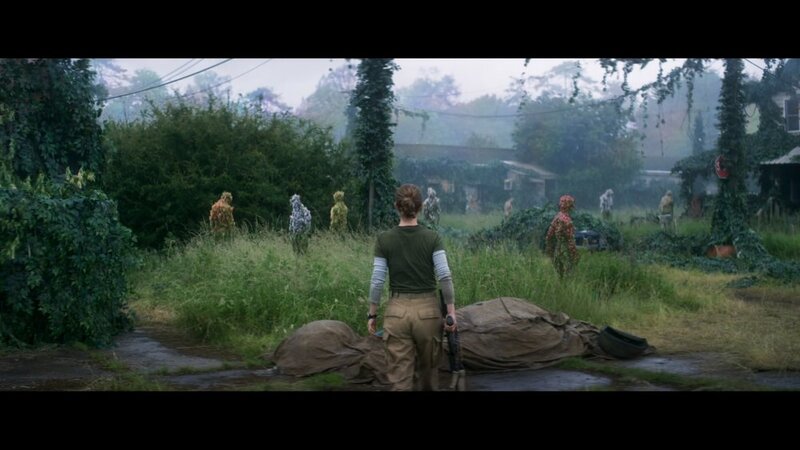 Throughout Annihilation we talk about individual cells, and the way that cells grow together, and how they’re directed by DNA, and hox genes, but we have to remember that we’re not simply talking about cells. We’re talking about what makes us fundamentally who we are. 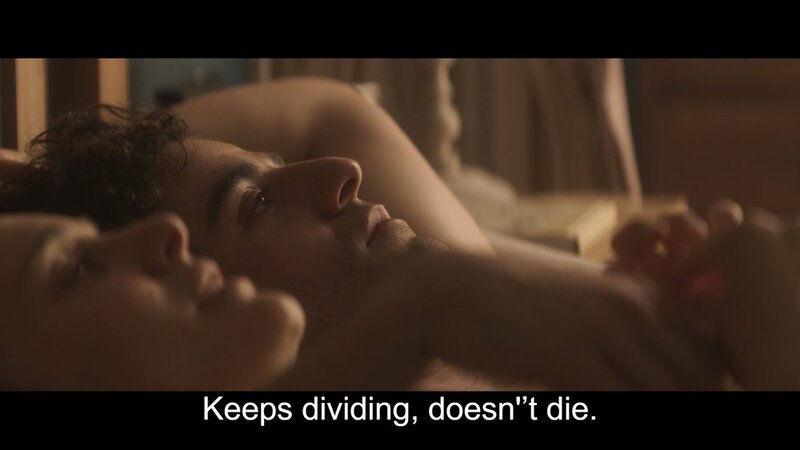 Lena and Kane (Oscar Isaac) lay in bed together, looking up through the skylight and seeing the moon out during the day. They joke about it being a mistake by God. Kane says that God doesn’t make mistakes and Lena disagrees. To clarify: The Hayflick Limit is the number of times a cell can divide before entering senescence (biological ageing). Most of us understand that our cells are constantly being growing, ageing, dying, and being replaced. We’re always physically changing, be that as we grow from a fetus to a baby, to an infant, or from a teenager to an adult, and then beyond. This process is shared among virtually all of known life. But it’s even more complicated than that in this case. Just as humans in general have evolved and via cellular mutation and natural selection from Australopithecus to homo sapiens, we to, within our own lifetimes go through immense change. Not just in appearance, but in who perceive ourselves to be, and who we are to the world. Life itself is defined by more be these adaptations than it is by its continuity. The person you were today is dramatically not the person you were fifteen years ago, and in some ways, two minutes ago. In mind yes, but physically as well. The description here is incredibly important, and very real. Moments throughout our life dramatically change who we are—and it doesn’t happen just once, this process is absolutely constant. Every day we define further what it will mean to be us, and every time we make that decision, we distance ourselves from who we were. After the four women have made it deep into the Shimmer, they happen upon a video camera of a past crew’s venture in. They play the video on it and we see Kane, cut open the stomach of another crew member. His insides appear as a jumbled nest of tangled intestines, or eels. They slowly slide through his hands. Just as we hear Cass describe her past life as, “dead” and worthy of bereavement, we see this intense visualization of the ways in which we are constantly changing. But the confusion here is that they aren’t really going anywhere and they’re not dying. They are just changing so extremely that they can’t understand it—and this drives them insane. 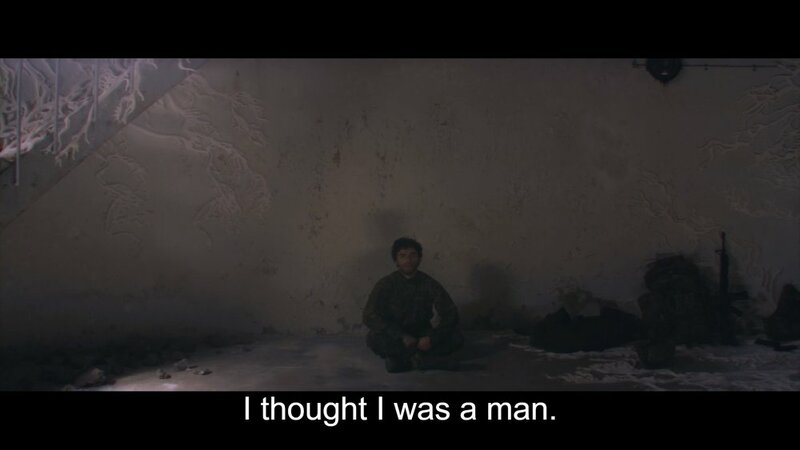 This view of change, that of your past self, or in this case your present self dying, is integral to the film. While Kane is away, Lena has an affair with a fellow professor, Daniel (David Gyasi). We see this play out in a series of flashbacks and we see how disgusted Lena is with what she’s done. Almost immediately after she does it, she understands the impact of what she’s done not only to herself, but to her relationship with Kane. Later, while keeping watch in the Shimmer, Lena asks Dr. Ventress why Kane volunteered for a suicide mission. While it is important to recognize that this affair is a self-destruction (an extreme change from your past self) of sorts, it’s much more important what Ventress goes on to say. This conflation of physical and mental self-destruction (extreme changes) is key to understanding what exactly is at work deep within our minds. What Garland and VanderMeer are telling us here is that not only do we have no control over our ageing process, of who we are physically from moment to moment, but we have virtually no real agency over our decision making as well. “These aren’t decisions, these are impulses” Ventress says. While reconciling our lack of agency is an existential high jump that seems impossibly high, it’s very easy to see that our decision making paradigm is more often than not less about our rational minds, and more about our physical, hormonal state of mind. If our amygdala is responsible for our emotional response, who/what is it that takes responsibility for your emotional responses to stimuli? Are you responsible? Are you responsible for your amygdala? Consider the story of Charles Whitman, the "Texas Tower Sniper." In what amounted to his suicide letter, he openly acknowledged that he had changed and had no idea why but knew he had no control. In what is truly a tragic story he expresses incredible sadness for who he uncontrollably had become and describes his impulses as foreign and confusing. In the letter he asks for an autopsy on his brain because he was unable to reconcile who he had become-- he knew something had changed. And despite having this awareness, one day he stabbed his mother, and wife, and killed sixteen people. It was later found in an autopsy that he had a pecan-sized brain tumor putting pressure on his amygdala. What does it mean to, "be ones own" if this is the reality? Who are we guided by? Or rather, what are we guided by? What does it mean to be anyone if not only are our bodies are in a constant state of evolutionary, mutational flux, but our minds are just an extension of this? Lena makes it to the lighthouse at the center of the Shimmer. She goes inside and finds another video camera, and plays the video. Kane is in the center of the room, speaking to the camera. 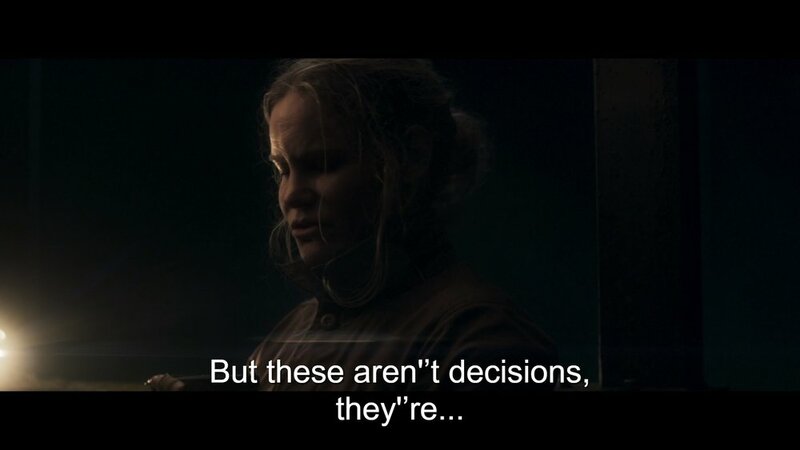 In probably the most iconic scene from the film, we see this shimmery black creature mirror every one of Lena’s motions—and eventually it takes her identical visual form. In the final scene of the film, after the Shimmer has been destroyed, Lena and Kane stand opposite each other. Lena says, “You’re not Kane are you?” Kane responds, “I don’t think so. Are you Lena?” Lena doesn’t respond, but we see in both of their eyes, something has changed. What happens when you realize that you are simply an assembly of cells, reproduced, and duplicated from other cells? Your present self, a mutated version of your past self? Your mind and actions at the mercy of the imperfect unpredictability of nature? Who are you? She’s describing not the end of life—but the ending of the individual.